What is The Right Slip Resistant Product for Me? Factors to Consider When Choosing a Slip Resistant Product. 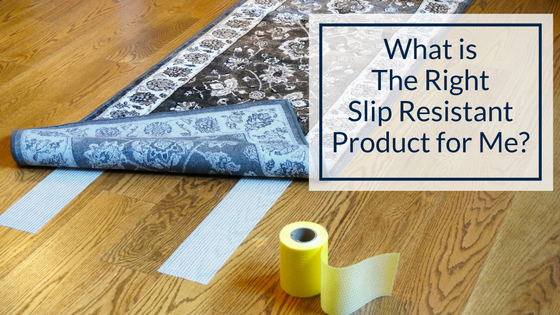 Over the years, we’ve noticed that many of our customers feel overwhelmed by the array of slip resistant products on the market and are not sure which to choose. We get it - with so many options, how do you know which is right for your home? So, we’ve put together this no-hassle guide to help you choose the best slip resistant solution for you. In today’s market, consumers are faced with many different options on how to keep their rugs or mats from moving and slipping. There are literally dozens of different brands that all claim to be the best at holding rugs and mats in place. The sheer number of choices available can be very confusing and often leaves consumers wondering which product is best for their needs. Never fear - this guide will explain the differences between the two major types of slip resistant solutions on the market and which solution is right for your circumstances. The first and most important thing to know is that all slip resistant products currently available to consumers work in one of two ways. They are either friction or adhesive-based and each type works to hold down your rugs or mats in fundamentally different ways. Both of these slip resistant technologies differ greatly in their effectiveness under different conditions. First, let’s discuss adhesive-based products and when you might use them. Adhesive-based slip resistant products use a releasable adhesive to secure your rug or mat to the floor. Examples of releasable adhesive based products would be rug tapes and rug tabs such as our Rug Gripper™ and Stay ‘n’ Place®. You need a secure grip to your floor. You’re concerned about cost (adhesive products cost less than full rug underlays). You need something that will work on multiple types of floor surfaces, such as marble, wood, tile, and carpet (brands like Rug Gripper™ can work on multiple types of floor surfaces including carpet). The other common type of slip resistant products is known as “friction-based”. Examples of friction-based products include all types of carpet pads and friction tapes, such as Grip-A-Rug™. Your area constantly needs to be cleaned because of pets or other environmental factors (adhesive products work best on clean surfaces). Where can I purchase Rug Gripper?